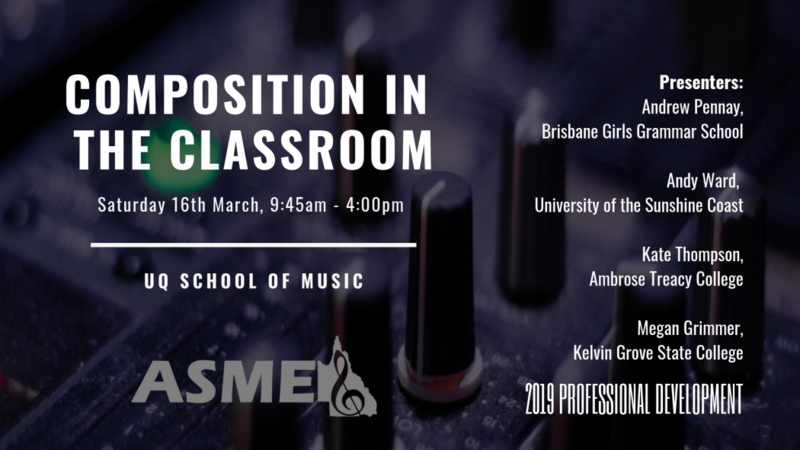 The Queensland Chapter of ASME provides advocacy, professional development and statewide representation for all music educators working in the primary, secondary, tertiary and private studio sectors. With a strong and rich history of music education in Queensland schools, our chapter network reaches across the entire state of Queensland and the chapter council works tirelessly to ensure the benefits of being an ASME member are available as far across Queensland as possible. In addition to the chapter’s work in supporting music education professionals, the chapter also hosts one of Queensland’s longest running composing competitions, the Young Composers’ Competition each year. This competition has provided hundreds of Queensland students will the opportunity to have their compositions adjudicated by professional composers and many former winners have gone on to forge a career in the world of musical composition. On this site, you will find information about upcoming events, professional development workshops and the other activities of ASME Qld. The ASME Qld Chapter Council invites you to utilise our support and even consider giving back to music education in Queensland by joining the Chapter Council.